Giving societies allow the West Point Association of Graduates to recognize the generosity of long-standing donors and thank them for their support in a way that seeks to create a lasting bond between them and West Point. If you have planned an estate or life income gift of $25,000 or more to benefit the Academy or the Association, we would be honored to add you to the rolls of the Cullum Society. Please send us a copy of the pertinent pages of your will or trust. Members of the Society receive a certificate of appreciation, a lapel pin, invitations to various West Point events, and the gratitude of the cadets and fellow graduates who will benefit from your generosity. 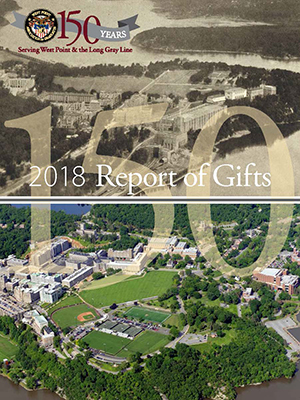 The total of all gifts received by West Point or the Association during a donor's lifetime determines membership in the new giving societies. Corporate matching gifts will count toward society membership. Total lifetime giving will be recognized by society membership as described below. The Superintendent's Circle recognizes all donors that make annual gifts of $1,000 or more to the Superintendent's Annual Fund, or the West Point Parents Fund within the calendar year (January 1 - December 31). The Superintendent's Annual Fund and the West Point Parents Fund are comprised of unrestricted gifts that strengthen the Margin of Excellence. These funds provide opportunities that enrich cadets' 47-month experience and allow West Point to remain one the nation's leading academic institutions. Members of the Superintendent's Circle take a leading role in providing the Corps of Cadets with research projects, extracurricular clubs, academic centers, tutoring programs, cultural immersion experiences, club sports, and athletics facilities, to name a few. Moreover, members provide the Academy with the greatest flexibility to respond to immediate and emerging needs, thereby ensuring that today's cadets have all the tools needed to develop into tomorrow's leaders. Recognition in the Chairman's Circle is offered to West Point graduates, parents, and other friends of WPAOG who annually make a gift of $1,000 or more to the Long Gray Line Fund or Endowment within the calendar year (Jan 1 – Dec 31). Gifts are tax deductible to the full extent of the Internal Revenue Code. Corporate matching gifts may be used to upgrade your gift. For more information on gift recognition, please contact stewardship@wpaog.org.